Such so called “contradictions” may trouble us and lead to attempts to explain them away. I think, however, we can appreciate that the Bible contains the same paradoxes and tensions that are found in life itself. Do wise, prudent decisions lead to good outcomes, or not? Should we spend our time in diligent work and study, or might we as well sit back and enjoy the ride? The answer, of course, is that it depends on the day. 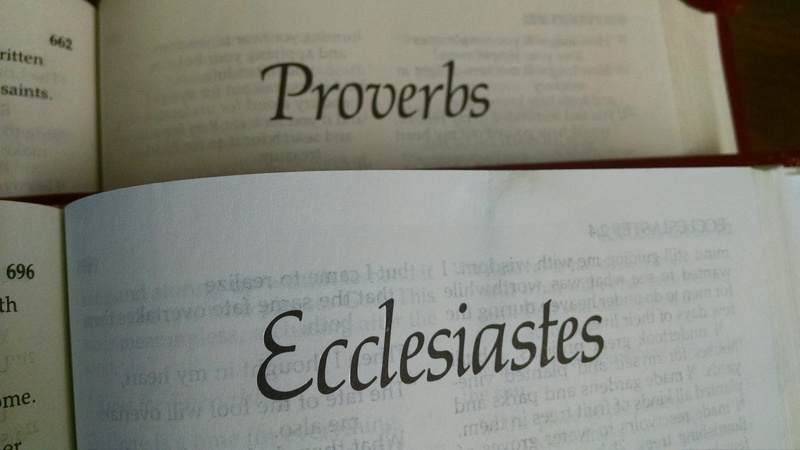 I love that both Proverbs and Ecclesiastes are in the Bible, because they are both true. Trying to “train up a child in the way they should go” (Prov 22:6) can be a little bit like teaching English grammar: I can give you some guidelines but there are tons of exceptions. The path between wisdom and meaninglessness is a winding, swerving one that both parents and children have to walk. As parents, we try to create a ‘Proverbs world’ of predictable punishment and reward, but we are also called to be there with guidance and sympathy when the world is unfair and doesn’t follow the rules. From that first dropped jaw when the word “please” doesn’t work to the teenage years of heartbreak and betrayal, Ecclesiastes days can be painful to watch our children go through. But also, as a parent, I have my own Proverbs and Ecclesiastes days. There are days when all the best wisdom and parenting classes I’ve been exposed to actually come through, and there are other days I have to ditch it and trust other instincts that only a parent has. There are days when I can muster the energy to be the calm example I’m supposed to be, and there are other days that I….well, we’re all human. Perhaps the most important point to remember in the midst of this tension is one I forget many times myself: don’t judge someone else who may be currently living in the other book. From the Proverbs zone, people in the midst of an Ecclesiastes day may appear distant, lackadaisical, or irresponsible. From the Ecclesiastes zone, people in the midst of a Proverbs day may appear unrealistic, assuming, or supercilious. I don’t know about you, but I can quickly forget what it’s like to live in the other book, even if I was just there yesterday. This tension is one we all live, but it only becomes a relational obstacle when we insist that the world is either one way or the other. As it is modeled for us in many biblical passages, we must walk this meandering journey with each other, not stake out our spot in one book or the other and expect our family and friends to always live there too. Perhaps it’s God’s way of reminding us that we never fully arrive. The reality that adults still struggle to navigate the Proverbs and Ecclesiastes days of life is all the more reason to show our children grace in their struggle. The common childhood phrase “it’s not fair” might be our signal that life has just switched books on them again.